Crabeater seals are probably the most numerous wild large mammal on earth, they are thinly distributed across a vast area. Breeding Season: Pups born from September to December, they are weaned at three weeks old at which time they are just acquiring an adult-like fur coat. Females become pregnant again one to weeks after their pup is weaned, it is thought that there is a period of delayed implantation of the foetus as in other similar seals. Estimated world population: - 11-12 million. Very difficult to gauge the population size as the seals are circumpolar and live in and amongst the pack ice. They are thinly spread over a vast area that is very difficult and expensive to survey requiring ships that are at least ice strengthened and preferably with air support. They are thought to be possibly the most numerous large wild mammals in the world. Feeding & diet: Not crabs! that was an error made by early sealers who gave them their name. They feed almost entirely on Antarctic krill, Euphausia superba, 95% of their diet is krill, the remained is squid and fish. They have highly adapted teeth which interlock to form a sieve to strain krill out of the water, their Latin name Lobodon means "lobe toothed". Diving: As Crabeaters feed mainly on krill, they don't have the need to dive so deep or long. A typical dive is around 11 mins and goes to 20-30m though they have been recorded as deep as 430m. Conservation status: Least concern. Crabeater seals are thought to have increased in number due to the decline of the great baleen whales which resulted in more krill being available for them to eat, though very little is known about historical population sizes. Protected by the Antarctic Treaty and the Convention for the Conservation of Antarctic Seals. Distribution: Circumpolar, one of the most southerly of all mammals, living in and amongst seasonally drifting pack ice. Predators: Leopard seals, Killer whales. Leopard seals are thought to be almost entirely responsible for a first year mortality of around 80% of crabeater seal pups. Most crabeater seals carry long deep scars evidencing a close encounter with a Leopard seal as a youngster. If they reach a year old, this threat seems to fall off very significantly. What are Crabeater Seals like? 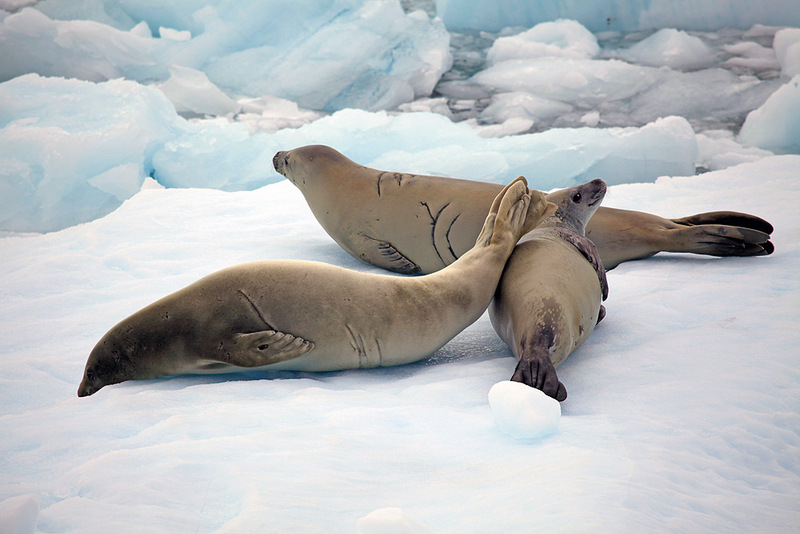 These are crabeater seals, probably the most numerous large mammals on earth after humans. The ones in the picture to the right are resting on a large ice floe floating in broken summer ice near the Antarctic peninsula. 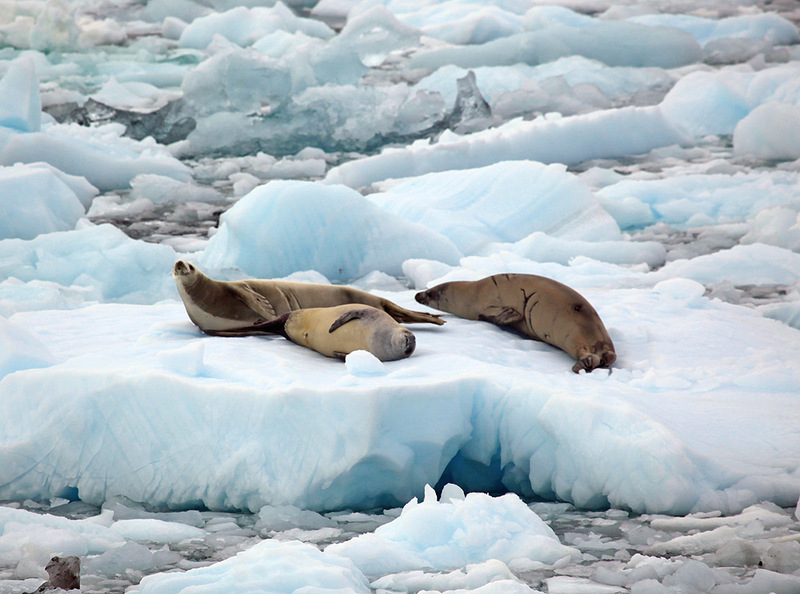 They are the amongst the most gregarious of seals, even so it is unusual to see many crabeater seals together as they live almost their entire lives on and amongst floating ice, they only form small loose associations. For this reason also, it is difficult to estimate their numbers, estimates vary from around 10million up to 50 million, none with a very high degree of confidence. 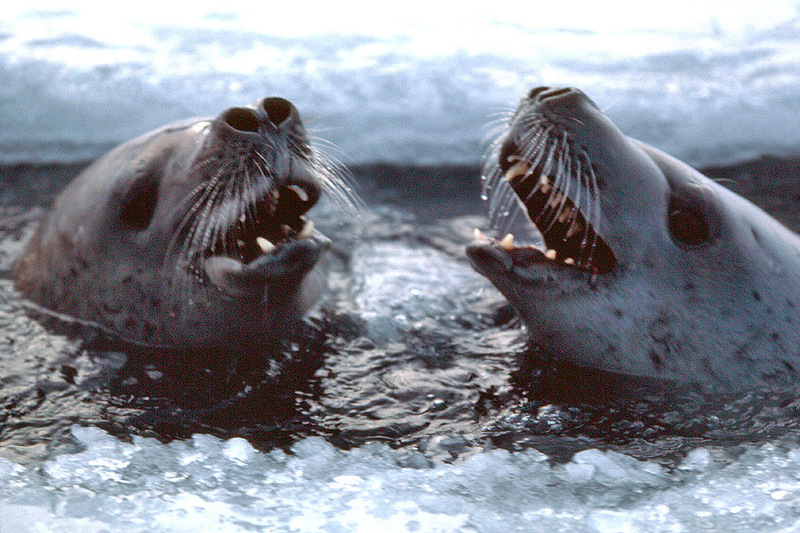 Crabeaters are large seals typically of about 220kg (484lb). They are fairly solitary, and the males and females are about the same size as the males do not need to be large to compete for a harem of females as in elephant and fur seals. Even when the females give birth, they are rarely near to other females. The female gives birth on an ice floe around September and suckles the young from a birth weight of about 20kg (44lb) to 110kg (242lb) at weaning, this takes around a month. As with other Antarctic seals, the female comes into oestrous very quickly and an attendant male will mate with a female, seeing others off. After mating the male leaves the female and goes to find another receptive female that he can mate with. Many seals give the impression that they form cosy family groups as they lay around together. The reality is usually that it is a mixed group of individuals with no real bonds other than between mothers and their own pups if present. Crabeaters are the most timid of the commonly encountered Antarctic seals, whereas most types of Antarctic seal will lay there pretty much oblivious to what's going on around them, Crabeaters tend to be more alert and are less easy to approach even if on an ice floe, they will quickly display signs of nervousness and are inclined to slip into the water and swim away. Why are they so often marked along their sides? 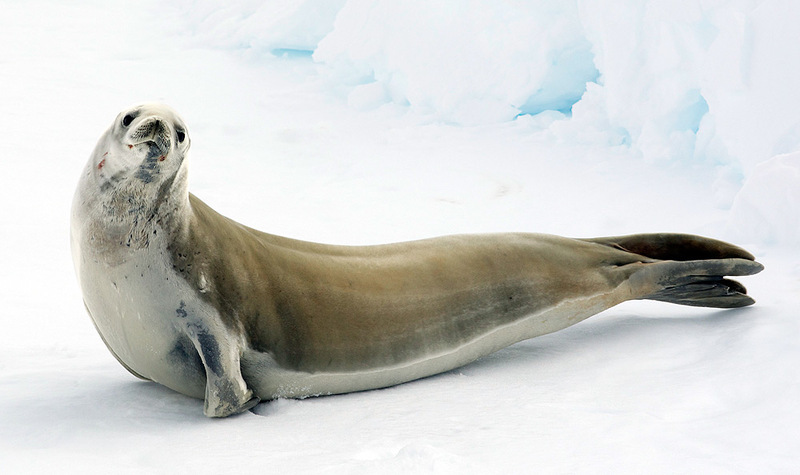 Most Crabeater seals, around 80%, have scars on their bodies. These are thought to come from attacks by Leopard Seals in their first year of life. 80% of Crabeaters don't make it it past their first birthday, predation by Leopard Seals is the main reason for this. If they can make it to their first birthday, then the risk drops off very dramatically, possibly because at this time, there are newer, slower pups around and they are getting stronger and faster swimmers by then. Killer whales are also predators of crabeater seals which will try to evade them by leaving the water and seeking refuge on an ice floe, the highly intelligent killer whales will sometimes work together to break the flow or wash the seal back off and into the sea. Do crabeater seals eat crabs? No. 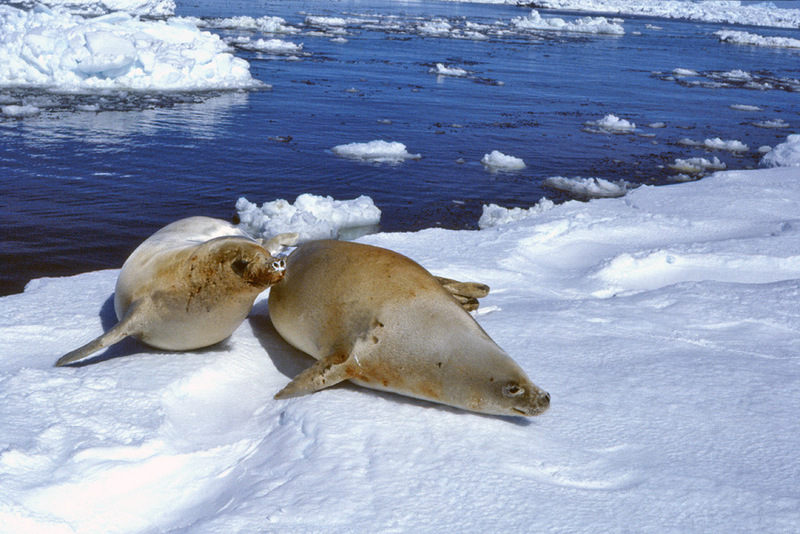 Crabeater seals probably got their name because of a mistake by the early sealers who went down to the Antarctic. They actually eat krill, the staple diet of much of Antarctica's bird and mammal population. There are very few crabs or any other Decapod Crustaceans such as lobsters in Antarctic waters. What there are tend to live in very deep water and are limited in distribution. 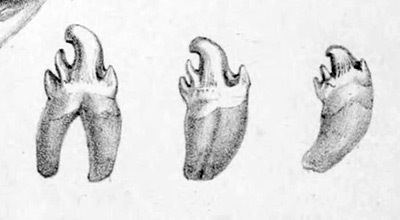 The highly modified teeth of a crabeater seal in situ in the skull. 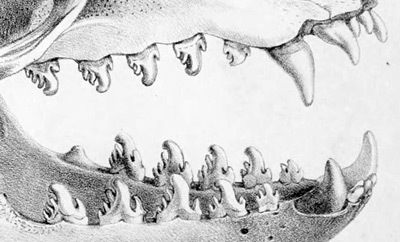 Crabeater seals are uniquely adapted amongst seals in that their teeth are adapted to form a sieve in a similar manner to the baleen plates of the great whales. They take a mouthful of seawater and krill and expel the water through gaps in their teeth while the parts that overlap prevent the krill from escaping. Each seal consumes about 20kg of krill per day, and a quick bit of maths calculates that between them, Crabeaters eat hundreds of thousands of tonnes of krill per day, that's an awful lot of little shrimps. They are circumpolar living all around the edge of the Antarctic continent generally following the seasonally variable edge of loose pack ice. They can be found using narrow tide cracks to breathe at while hunting beneath the ice for krill as these two in the picture to the right are.